In this new story by Michael Snyder over at End of the American Dream that Steve Quayle had linked to on his website this morning, Snyder reports what may be one of America's coldest and snowiest November's ever may only be getting worse. While the left continues to scream 'global warming' and attacking President Trump for backing out of the Paris Climate change agreement, in the only video at the bottom of this story, Rick Wiles and TruNews feature Professor Valentina Zkarkova, whose latest weather models have been updated to show our planet may now be entering a cold snap lasting not only decades, but centuries. And while we won't go out on a limb and claim a 350-year ice age is coming to our planet as we read in this TruNews story and hear in the video from Professor Zkarkova, as Ice Age Now had reported back on November 12th in a story which the Drudge Report had linked to, according to NASA scientist Martin Mlynczak, we could be witnessing record cold weather in a matter of months due to a lack of sun spots. “If current trends continue, it could soon set a Space Age record for cold,” said Mlynczak. 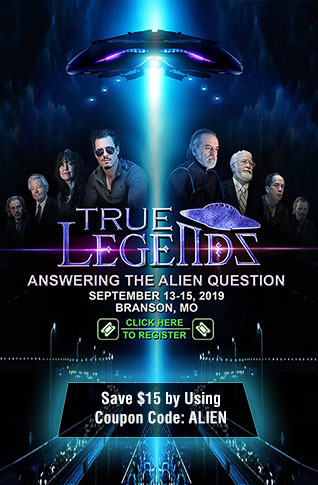 “We’re not there quite yet, but it could happen in a matter of months.” And in the same story they report that according to Dr. Tony Philips back on September 27th, “The sun is entering one of the deepest Solar Minima of the Space Age". 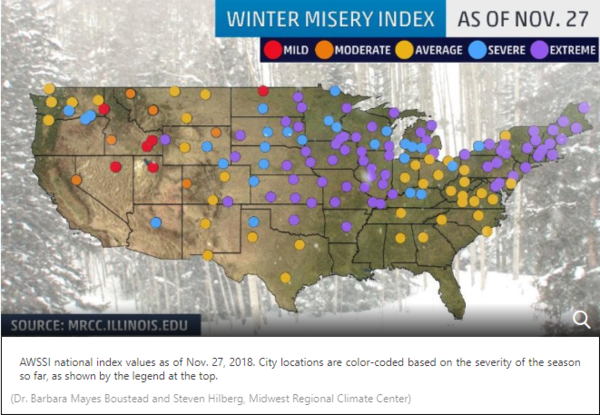 And as we see in the map on the top of this story taken from this November 27th story at the Weather Channel, approaching the end of November, it's been one of the most miserable starts to winter on record with the 'misery index' at 'extreme' or 'severe' for huge chunks of the country. From that story. It's already one of the coldest and snowiest starts to the winter season in parts of the Northeast, Midwest and Plains, and we haven't finished November yet. This index takes into account the "intensity and persistence of cold weather, the frequency and amount of snow and the amount and persistence of snow on the ground," the Midwest Regional Climate Center says. Wind and mixed precipitation, such as freezing rain, are not a part of the index. Nov. 1-26 was the third-coldest on record in Kansas City, Missouri; third-coldest in Little Rock, Arkansas; seventh-coldest in St. Louis; seventh-coldest in Oklahoma City; ninth-coldest in Des Moines, Iowa; and tied for the ninth-coldest in Dallas/Fort Worth, according to data from NOAA’s Regional Climate Centers. It has also been a top-10-coldest November in parts of upstate New York and New England. And while Snyder asks what's going on with all of this crazy weather and avoids the topic of weather modification while pointing to the previously mentioned NASA scientists warning of an approaching mini-ice age, he concludes his story by reminding us how often throughout history such periods of cooling upon our planet Earth have caused great disruptions to the global food supply, which even now scientists are warning is becoming increasingly vulnerable. Then warning us that during the last 'mini-ice age', food production all across the planet dropped dramatically and famine broke out all across the planet, we don't need to look all the way back to the last mini ice age during the 16th or 17th century to see the utter catastrophe that can be caused to a the global food supply by an extended cold spell. Snow in June, freezing temperatures in July, a killer frost in August: "The most gloomy and extraordinary weather ever seen," according to one Vermont farmer. Two centuries ago, 1816 became the year without a summer for millions of people in parts of North America and Europe, leading to failed crops and near-famine conditions. In addition to food shortages, the natural climate change caused disease outbreaks, widespread migration of people looking for a better home and religious revivals as people tried to make sense of it all. And it could happen again. Big volcanoes can erupt at anytime and with little warning, potentially changing the climate and giving a temporary reprieve to man-made global warming. So with cold weather chilling much of America, we'll open up the comment section below to winter weather prepping tips that anybody might like to share with nothing like a hot fire burning to keep us warm this time of year.